Indus Valley Bio Organic Aloe Vera Gel is an absolutely pure Aloe Vera gel, lightweight in nature that is capable of penetrating into the deepest layers of the skin. This indeed gives your face and skin a refreshing glow internally. Aloe Vera Gel is completelyly 100%pure, Non-toxic in nature, Lightweight in nature and does not have a greasy. 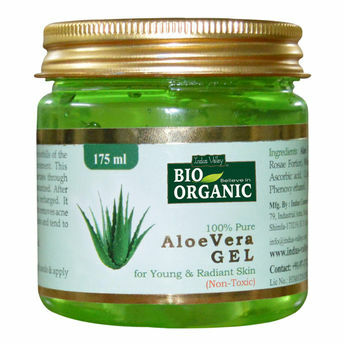 Aloe Vera gel is gleaned from the leaves of the Aloe Vera plant. People have used it for centuries to treat skin infections, burns, wounds and other kinds of skin conditions. Shop more Indus Valley Bio Organic Products here.